The United Arab Emirates’ Ras Al Khaimah captivated the world with its 2019 New Year’s Eve Fireworks that welcomed hundreds of thousands of visitors. Organized by Marjan, with the support of Ras Al Khaimah’s government entities, and put together by Fireworks by Grucci, the Ras Al Khaimah New Year’s Fireworks, spanning a duration of over 13.20 minutes, also clinched two Guinness World Records for the ‘Longest chain of fireworks’ and the ‘Longest straight line of fireworks’. This year, the celebration was made even more memorable for the visitors with Al Marjan Island, the venue of the event and the flagship lifestyle destination by Marjan, hosting several family-oriented activities. Positioning the event on the global map of New Year’s Eve celebrations, the Ras Al Khaimah event was telecast internationally, and its images and videos shared on social media by millions more. The celebration flagged off with a fascinating pyrotechnic tribute to the late Sheikh Zayed bin Sultan Al Nahyan, the founding father of the nation. In a befitting conclusion to the ‘Year of Zayed’ marked in 2018 to coincide with his birth centenary, the night-sky of Ras Al Khaimah came to life with a brilliant image of Sheikh Zayed followed by a magnificent fireworks display. Clinching the Guinness World Records for the ‘Longest chain of fireworks’, the first pyrotechnic display, the tribute to the late Sheikh Zayed, featured 11,284 firework devices. The earlier record was for deploying 10,005 firework devices set by Viejas Casino & Resort (USA) in Alpine, California, USA, on September 12, 2014. Fireworks were deployed from 52 sites along Al Marjan Island and the waterways of Ras Al Khaimah’s coastline, with the total length of the chain exceeding 4.6 kilometers. The show was designed to 12 international music compositions, and the record was set in just 40 seconds. This was followed drone countdown to the New Year. A canopy of golden showers followed, and Ras Al Khaimah won the Guinness World Records for the ‘Longest straight line of fireworks’. The stunning display spanned an area of 13 kilometers, trumping the earlier record set over a distance of 11.38 kilometers. The display had the largest caliber of aerial shell at a diameter of 600 mm, the largest used in the UAE for any fireworks display during this New Year’s Eve. 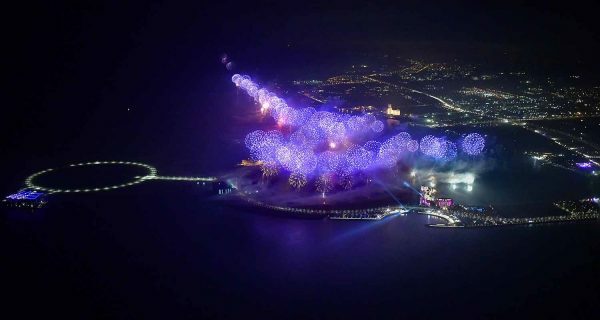 The record was set in 12.06 minutes, with fireworks positioned at 13 sites across Al Marjan Island and the waterways along the RAK shoreline. There were seven themed chapters for the show, which was set to international music compositions. The inspiration for the fireworks display was the natural beauty of Ras Al Khaimah, and it was choreographed to highlight the beautiful beaches and resorts along the Emirate’s shoreline. A 200-piece SkyMagic drone show was precisely integrated into the fireworks design. Scenes such as the tribute to Sheikh Zayed were displayed within a 100m space in the sky accented by colorful bursts of fireworks. A sweeping display of a falcon spreading its wings emphasized the heritage of the Emirate. Designed by Phil Grucci, CEO & Creative Director of Fireworks by Grucci, the event was verified by an official adjudicator from Guinness World Records for the ‘Longest chain of fireworks’ and the ‘Longest straight line of fireworks.’ Following the fireworks gala, Eng. Al Abdooli and Phil Grucci, received the Guinness World Records titles from the adjudicator. 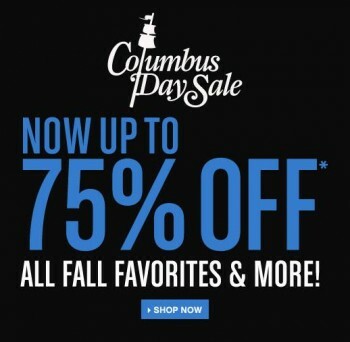 Bluefly.com Columbus Day Sale – up to 75% off all fall favorites and more!